One of the things I get asked about most from my lovely readers is how I create birthday banners for the chalkboard posters I’ve shared here. (Check out my All Things Chalkboard series to see them all!) Well, since so many people are interested in learning how to do this, I figured it warranted its very own post! So, in the following tutorial, I’ll show you not only how to create a cute little banner you can add to your child’s birthday chalkboard poster (or any kind of design for that matter), but I’ll also share ways you can jazz it up….because no boring banners for us! Before we begin, make sure you check out my tutorial for how to make a birthday chalkboard poster if you haven’t done so already. That covers a lot of the tools and techniques I’ll be talking about below and will probably save you a lot of head scratching and “Huh?” moments. And don’t miss my collection of the best free fonts to use with birthday chalkboard posters….I even include some of my favorite banner dingbats! Also, this tutorial describes the method I use for creating banners in Photoshop Elements (I’m using the dinosaur Version 11 but the current one available is Version 13). It’s probably (hopefully!) very similar to other design programs. And now….on with the tutorial! There are lots of fonts out there that are banner dingbats, some more elaborate than others. For this tutorial, I’ll be showing you how to create one with KG A Little Swag. The key principle behind making one of these colorful birthday banners is the same thing that ogres have in common with onions: LAYERS. Yep, that’s really all there is to it. You’re just layering different levels of dingbat fonts to create a a cute little digital banner. Tada! Tutorial’s over. ;) Haha, just kidding. The easiest way to see what characters or embellishments are available in a particular font, especially a dingbat font, is to check out its character map. This is a little chart that pairs up the actual keyboard key with what will be displayed when you type it. Sometimes I also use my favorite way to preview all my fonts at once. You can usually find the character map on the font’s download page online, and sometimes they come included in the .zip file along with the .otf and/or .ttf font file(s). For example, here’s a screenshot of KG A Little Swag’s character map from its download page. As you can see, it shows what dingbat appears (the black pennants or embellishments) when you type something (the light gray characters in the top left of each box). This particular dingbat has long and short pennants as well as stitches and ropes that they hang from. The long pennants correspond to capital letters and the short ones to lowercase. Therefore, to get them super cute and alternating, I’ll need to type this: HaPpY 1st BiRtHdAy! Looks a little cray cray, huh? Maybe you typed or wrote like this when you were 15 and thought you were soooo clever and artistic? Not saying I did that or anything…. Don’t worry about what you actually typed (which appears on the righthand side of Photoshop in your Layers Menu). All that matters is what appears in your image. Ok. Here’s the whole reason why I’m writing this very tutorial: SO. MANY. PEOPLE. have asked me “Yeah, I get all that Christine, but how do I change the colors of the individual pennants like in your son’s or niece’s posters? ?” Well, here’s the answer! It’s super simple too. Double-click on your text so the entire layer is selected (highlighted). Move your mouse and click and select the individual letter (so click next to it and then drag your mouse over it while holding your mouse down). Open up the color option from the Text Menu at the bottom and select your new color. Yay! Once you click off the letter, you’ll see it has changed color. Repeat for rest of the banner. Create a duplicate layer (either go to Layer –> Duplicate Layer, or right-click on the text layer and select Duplicate Layer). Rename this new layer if you want (I usually don’t bother), then click OK.
Use the Move Tool and move the new layer out of the way so you can see it. Change the new layer’s color to whatever color you want the shadow/background to be. Now you’ll probably need to go in and change the characters of your new layer to solid pennants. Otherwise, you’ll still see bits of the chalkboard showing through the areas where the actual letters are since they’re transparent….probably not what you want. To do this, I referred back to this font’s character map and saw that the long solid pennants are created by typing > and the short ones happen when you type <. So to create a matching layer of solid pennants, I typed ><><> ><< ><><><><>. Once again, you can see in the Layers Menu on the right how all my layers look based on the actual keystrokes. Then you can either move this new solid layer down and perfectly align it behind the colored banner so just the letters are filled in with this new background color (like I did in the graphic at the top of this post), or you can offset it a tad to create an actual drop shadow look. But it’s not actually a banner if it’s not hanging, amiright? We therefore need to create a rope for all the pennants to hang from. Most of the banner dingbats provide various decorative ends and solid lines for ropes. Once again, check the character map! For this particular font, the decorative ends are created by typing parentheses ( or ), and the solid rope that attaches the two is an underscore _. Therefore, to create the rope for this banner, I created a new text layer and typed out (________________). Then I had to move it into position and change the arrangement of the layers so the rope was behind the other two. You can do this by either dragging and dropping the rope layer underneath the others in the Layer Menu, or selecting it then going to Layer –> Arrange –> Send Backward. Some of the dingbat fonts also provide additional embellishments to jazz up your banner even more….fun, fun! In this example, I added some purple stitches to the top of the pennants. To do this, either duplicate one of your pennant layers or create a new layer, and type out the necessary characters. For this example, the % sign creates the stitches for a single pennant, so I just typed out the same number of % (with the two spaces between the words) to create the stitches on all the pennants. So what it looks like is %%%%% %%% %%%%%%%%%. Then I moved it down over the banner and arranged it so it’s the top layer. But wait! There’s more! :) Let’s say you want to get extra super fancy and have a banner that hangs down instead of straight across. You can do that in Photoshop too! Sorry, but if you’re using Preview on a Mac, you’re out of luck with this option (as well as many others). To add some gravity to your design, you’ll need to warp the text layers. I’ve already described what warping text is and how to do it, so be sure and check that out for more details. For this particular design, the Arch style seems to work best (and since you want the banner to hang down, you’ll need to use a negative bend percentage). You’ll need to warp each text layer individually (boo, I know), so just take note of the percentage amount for your first one and then use that same number for the others so they all line up perfectly. You can also add multiple warp styles, like I did for the banners in the graphic at the top of this post. Both of those banners have Arc & Arch styles….I just didn’t want to complicate the example in this tutorial too much! But wait! There’s still more! ;) What if you like the shape of the pennant, but not the actual font of the letters/numbers that are displayed on them?? Well, by golly gee, just pick your own font! 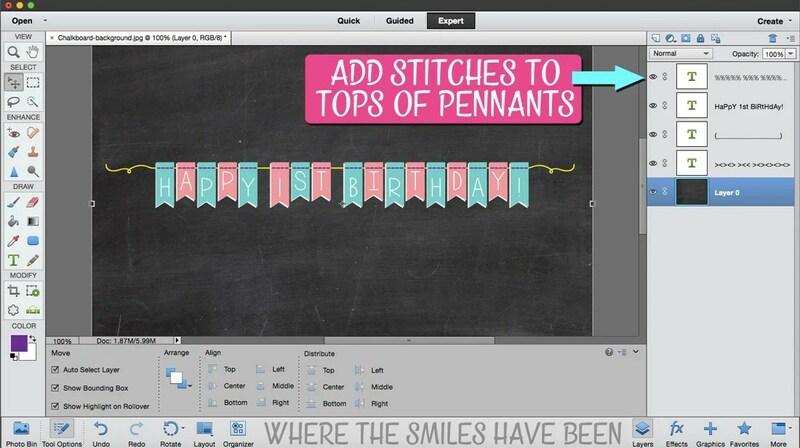 Go to your top (original) ‘Happy 1st Birthday!’ layer and change your 1 pennant to a solid long pennant by typing a >. Add a new text layer in whatever new font you want and type 1. Move it into position on the banner, and if necessary, arrange it so it’s on top and resize it to fit. Like I mentioned, you can do this with the entire greeting if you want, but be aware that it may not work so well if you end up warping the banner. The font may look a little weird or not fit correctly on the pennants, so you may need to do a little experimenting to find a font that works well. Also, don’t forget to check out my All Things Chalkboard series for even more tutorials on jazzing up chalkboard posters! « How to Make and Install Pallet Bookshelves with Knobs for Bonus Storage! Love this however I am having a little bit of trouble getting this to work on my Mac. Any suggestions? So far I can get the words typed but then get completely confused in changing color, layering, etc. All of these things are simple to me in a microsoft based format but on a Mac — I am lost!!! Hopefully that solves some of your problems. If not, there are TONS of resources out there on the interwebs including YouTube that are great resources. Sorry I can’t give you more specifics but it’s difficult without knowing what program and version you’re using! Good luck! Sou brasileira e gostaria de dar os parabéns pelo seu maravilhoso post, muito me ajudou, muito obrigada. 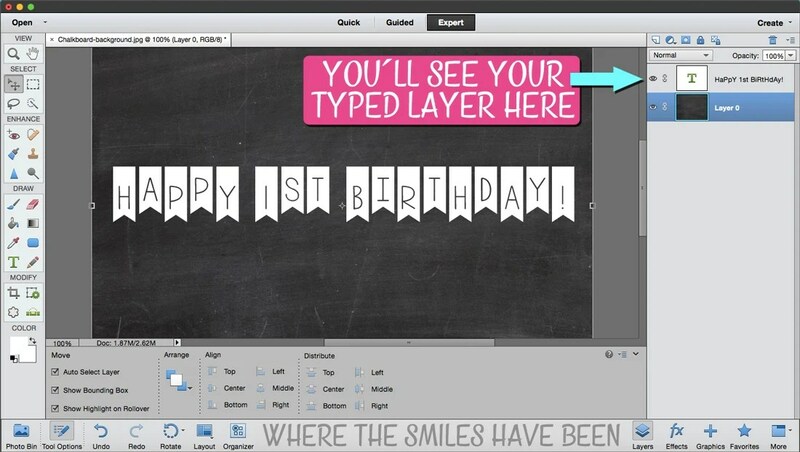 I really love love love your post on how to create the chalkboard birthday poster! I downloaded all the fonts you have suggested but somehow I am not able to pull everything together. I want to request if you could share what you have done for ROWAN and I could edit it for my son ARJUN? Please let me know. I have spent 2 days straight on this and asking you for help as the last resort as I don’t want to drop this amazing idea for the party. I Deepika! I’m so happy to hear you found inspiration here! I’m sorry but I can’t share the file I used for my son’s poster. I spent a great deal of time on it making tweaks until I got it just the way I wanted….I think I started working on it in January for his party at the end of May! I also might end up selling these one day. Besides, I used dozens and dozens of fonts on it, all of which I haven’t listed on my various chalkboard posts, so it’s highly unlikely you would have all of them….therefore they wouldn’t show up on your end. First of all, I am so sorry for asking such uncomfortable question. I totally understand! Thanks for your reply ! By the way, I finished the poster that I started and it came out pretty well. (definitely not as good as yours :) ).. I will keep following your page and thanks once again! If you click the “link layers” icon, you don’t have to move each layer individually! Love this! Great tutorial!! I’ll have to keep this in mind for the next birthday.